- uncrackable, short, user-friendly, high-converting links! Affiliate commissions thieves now have something to fear! Prevent them from stealing your affiliate commissions and get the full rewards of your promotional efforts. Attach a call-to-action to your links and share other people's content (articles, videos, offers, etc.) while driving traffic back to your own content. That's smart traffic generation! - build a massive downline virally! Build a huge downline with no effort and email it every few days to build a strong relationship with your contacts and promote any offer you want. List building has never been so easy! Advertise your offers with our text and banner ads and even get guaranteed visitors! Boost the quality and quantity of your traffic with our easy-to-use advertising tools and instantly increase your online income. - cheap, high quality lead generation! Receive mailing credits simply by logging into your account daily, getting traffic to your links or referring active members to ViralURL! Optional upgrades to automatically receive between 200 and 2,200 mailing credits extra every day or to email 3,000 to 6,000 fellow marketers every 3 days and generate qualified leads at a very low cost. A must-have for any internet or network marketer! - boost your online income! Earn above industry-average commissions on upgrade sales and skyrocket your online income! No matter if you promote the system or not, you can earn commissions virally! Thank you, Frank and Colin! 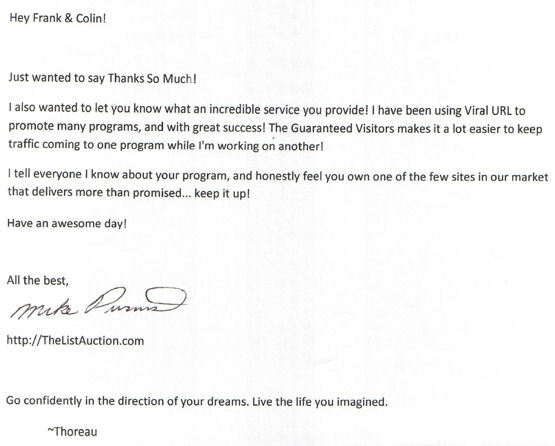 I have met some wonderful business partners with ViralURL! I have found this to be one of the most successful ways to meet new people that are truly looking for success in their business(es). I enjoy that fact that I have been able to help so many more people achieve their goals because we have crossed paths through ViralURL. Keep up the great work on your end! I appreciate everything you both have done for me and my business partners! I am new to the e-business community and I had been struggling in my efforts to start a business. I tried many different programs but nothing seemed to work. I actually stumbled across ViralURL while surfing. I was just about to give up on my e-business and this was the last program I was going to try. The ad tracking tool was the first I tried and immediately I was able to see what was working and what wasn't. My business started to soar. The tools in this program are amazing and a 'MUST HAVE' for anyone who wants to be successful. What I like about Frank Bauer's ViralURL.com is I can quickly cloack my affiliate links without having to buy a separate domain name for each link and the landing page looks like it is my own site, because Frank has provided the means to change the page title to reflect the name by which I have cloaked the link. I am now driving BOATLOADS of laser targeted TRAFFIC to my site.. All on AUTO-PILOT! I have been an Internet Marketer for over 8 years now and own sevral successful sites. In all my years, no-one has been able to pull off such a simple system! ViralURL has produced incredible results for my new campaign! I cannot keep up with the leads and will certainly teach my group how to use it. I've never seen results like this; it's truly a one-stop-shop. Over $600 in commissions from one email! ViralURL is awesome! I am very impressed with the service and I have made over $600 in commissions from one email! You're doing a great service to everyone by allowing them to protect their affiliate links and also grow their lists automatically! This is one service I would recommend to anyone. It doesn't matter if you are new to affiliate marketing or are a super affiliate, ViralURL can help you save and make money very easily! ViralURL was a stroke of Genius. 1= List Building and 2=Tracking. By combining both of these elements, a newbie (or an old hand :) can get results. So far, our commissions have been good from using this as a day to day tool, without having to hard sell it to people. The natural use it has comes before anything else. ... the biggest 'passive advertising' payment I have ever received. "Frank Bauer has just sent you $58.10 USD with PayPal"
What? What have those scammers thought up now stealing credibility by stealing and using a ViralURL name like that? I'm not due those types of commissions. So out of pure curiosity at who would have the nerve to write such a bogus headline on their marketing link I clicked on it and SURPRISE! ViralURL sent me cash! WOW! I thought. That is the biggest 'passive advertising' payment I have ever received. Usually when I am trying to make a commission like that I am actively promoting a program but this one and the referral that triggered the sale both came to me when I was using ViralURL to cloak my other programs and generate free ad credits through the ViralURL network. All I can say is thanks guys! That was a nice SURPRISE! And I may have to work in a more ViralURL focused way in the future in order to create more of them for both of us. You are getting RIPPED off! Your hard work and marketing costs are being blown with customers ripping you off... Not anymore: ViralURL protects you and ensures your affiliate links are never exposed. Stop leaving money on the table! You're missing out on FREE traffic! Everyone likes to share great content, right? Well, you can now take advantage of the power of word-of-mouth and social media by cleverly attaching a call-to-action to the links you share. With our smart traffic generation system, you can share other people's content (articles, videos, offers, etc.) while driving traffic back to your own content. Marketing is a very tough industry but if done right, is VERY profitable! You ever wonder why some people make huge income online whilst other lose money? The ones making the money understand a few simple concepts and have the right systems in place. When promoting products or sharing content with links shortened, cloaked, protected, tracked and customized with ViralURL, the users clicks the link and stats get recorded for you. They see your call-to-action, click it and are shown any page you want. Also, I they like the system and join ViralURL, they go in your downline! 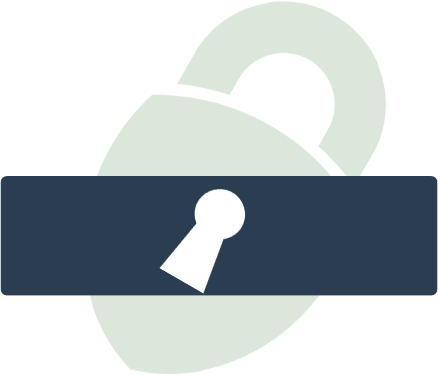 ACT NOW and ensure your affiliate links are never exposed to commission fraud! ViralURL not only protects your commissions and helps you take advantage of the power of word-of-mouth and social media, but also gives you powerful tools to generate targeted traffic and qualified leads. With our system, it promotes itself and builds your downline on AUTO-PILOT! All you need to do is to use ViralURL for your links. You can email your referrals and their referrals (down from 5 to 7 contact levels deep) every 5 to 7 days! The advertising and mailing tools will help you generate traffic and leads in no time! Email random members every 1 to 3 days with one of the industry's most powerful system mailer! JOIN NOW before you realize what you're missing out on! It is time to turn your computer into a profit making MACHINE and secure your financial future! If you have any questions, feel free to contact us any time. What are you waiting for? Simply enter your email address to get started! Just want to thank you for letting me know about ViralURL. In a couple of minutes I got the ViralURL system running on Auto-Pilot! Now it's promoting itself, promoting my sites and building my list... oh, AND the $360 Dollars from the ViralURL commissions. Lucky I went GOLD otherwise I would've only made a couple less dollars! But I gotta be honest with you... getting all those emails was not that cool, so thanks for adding this new membership level and I am sure your members will love it! Sensational system and I can see it's only going to get BIGGER. Love the new Banner advertising system I can use too! Keep up the great work... and DON'T STOP building this thing. It's working fantastic for me! Thanks again. Want To Advertise in German? ...and Instantly Harness the Power of ViralURL!